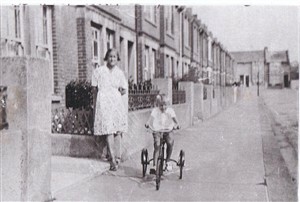 I lived at number 35 Bennett Road from 1944 until 1964 when I got married for the first time. My dad and mum lived at number 35 until their passing in 1968 and1985 respectively. There were houses missing in Bennett Road where we played, we called it the bombsite. One day there was a big rat spotted wandering around on the bombsite. Someone called Mr. Dale from number 47 who came along and dispatched the rat with a big stick. Mr. Dale kept chickens and ducks so rats were his enemy. 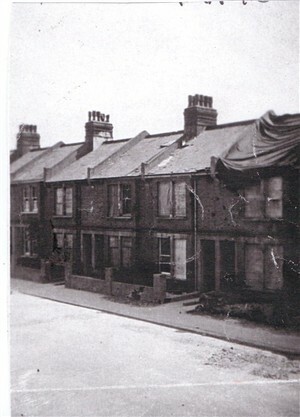 As well as Bennett Road losing five houses there was also damage from bomb splinters to other houses in the road, (see photo). In the late 40s and the 50s at the very end of Bennett Road on the right hand side there was a firm called Sussex Crumpets where we could get a carrier bag full of crumpets in the late afternoon for six pence. At the end of the road was a sweet shop run by a Mrs. Smith who had a parrot in a cage. The parrot was always outside on sunny days and would shout at passers by. On the corner opposite Mrs. Smith's there was an ice cream factory. On very hot summer days we kids would stare in the window at what was going on. One or other of the girls working in the factory would bring a big chunk of ice cream out to us kids. We must have been standing on our tongues. The photo of the lady and the little boy was taken outside number 35. They were the residents in the house before we lived there. Mr. and Mrs. Starley and their son John. John sent me the photos from Australia where he lived after emigrating. Bennett Road has so many more memories for me, a lovely place to have lived. Only five minutes from the sea, and only five minutes from the countryside via East Brighton Park and over the hill to Ovingdean. This page was added on 13/04/2012. Wow. My grandparents and father lived at 54 for many, many years, including the time you mentioned. I wonder if you remember them. I'll forward this to my dad and see if he can remember you. All the best! Hello Paul, so glad to see that you forwarded the article about Bennett Road to your dad. I remember your dad David from my childhood and his mum and dad. Thankfully my memory is still vivid and I can remember many things from that time. It was a happy time for us kids just after the war despite a bit of austerity sometimes. Best wishes, Mike Peirson.